Hitman: Agent 47 is an adaptation of a popular video game. It's also a reboot of a 2007 film. One might reasonably ask what this production does that wasn't accomplished in either of its other incarnations. The answer is: nothing. But that's never stopped the movie industry from moving ahead with a title if there's a whiff of money to be scented. Hitman: Agent 47 is typical of what we get in late August when the dog days have set in: forgettable motion pictures that are more interested in providing brief distractions than full-bodied experiences. The film, brought to the screen by Polish director Aleksander Bach (making his feature debut), is little more than a string of action sequences. The narrative, which borders on incoherent, is advanced through short bits of dialogue. Attempts at character development fall somewhere between laughable and nonexistent. Hitman: Agent 47 feels more like a highlight reel than a complete motion picture. Only a bare minimum of non-action scenes were included in the final cut. There's enough here to piece together a rudimentary storyline but the details are often either confusing or nonsensical. There's also a moment when a character is shot in the back but apparently suffers no ill effects. Either I missed something or the filmmakers did. It's possible to craft an all-action film that grips audiences. Recent examples include The Raid and Mad Max: Fury Road. Hitman: Agent 47 is missing a key ingredient, however. It lacks a discernable pulse. The action sequences, although assembled with workmanlike efficiency, don't offer anything special. Good action films succeed because the shoot-outs, fights, and chases are suffused with suspense. The characters in Hitman: Agent 47 so thinly drawn that we never care much about them and, without that factor, an action scene is little more than a representation of stunt work and special effects - a ballet of violence, signifying nothing. Action scenes should elevate the heart rate but the absence of intensity in Hitman: Agent 47 keeps the adrenaline at normal levels. Hitman: Agent 47 opens with a lengthy voiceover providing background about the global situation. The main story involves the titular character, played with steely determination by Rupert Friend, traveling with a young woman named Katia (Hannah Ware) to find her dying father. He's reclusive genius Litvenko (Ciaran Hinds), the man responsible for the "Agent" program that gave 47 his super-strength and durability. They are pursued by an enemy asset, "John Smith" (Zachary Quinto), and a small army of men who provide target practice for 47. The movie offers a series of twists to keep things from becoming too predictable. In fact, the first 20 minutes (or so) work as an homage to The Terminator, with the seemingly indestructible 47 carving a swath of death and destruction to get to Katia and John. Things change, however, when the truth about the characters' motivations are revealed. Of course, all is not as it seems. This leads to a lot of shooting and fighting. None of the action sequences stand out. In retrospect, they blur into one extended canvas of carnage. 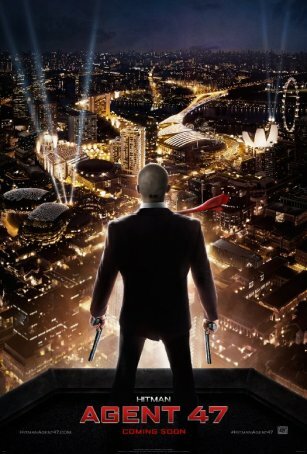 Hitman: Agent 47 bears little resemblance to the 2007 title, Hitman (although both were written by Skip Woods). It's intended as a reboot rather than a sequel. The earlier film was significantly better - one of the more impressive video game movies to have been produced. It invested time and effort into character development rather than relying on a string of generic action sequences to keep things moving. It's unfortunate to see the new version backslide into the morass of subpar genre efforts. Hitman: Agent 47 might offer a passable diversion for action junkies but, for everyone else, it's best avoided.